This network of environment and health focal points met in Bonn, Germany, on 20–21 March 2018 for the eighth meeting of the European Environment and Health Task Force (EHTF) to kick off and collaborate on developing these portfolios. Participants shared resources and discussed the technical support available, and also showcased examples of how countries have addressed the priority areas through multisectoral collaboration. 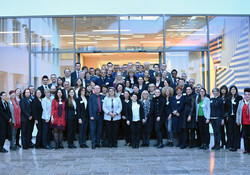 During the meeting, the EHTF also elected its Bureau. The new Chairperson for the coming year, Dr Nune Bakunts of Armenia, took over from Mr Robert Thaler of Austria. Other members of the new Bureau represent the health and environment ministries of Austria, Israel, the Netherlands, the Republic of Moldova, Serbia, Ukraine and the United Kingdom. The Bureau guides the preparation of the EHTF meetings and supports the WHO Secretariat in the intersessional period. The next EHTF meeting is scheduled for 2019. Through the European Centre for Environment and Health, WHO/Europe provides Member States with expertise on the most up-to-date evidence on the nature and magnitude of existing and emerging environmental health risks, and assists them in identifying and implementing policies to address these risks.